The director of Dark Souls and Bloodborne opens the curtain on FromSoftware's mysterious new project. A few weeks ago, I was granted an opportunity one does not pass up: a one-on-one interview with Hidetaka Miyazaki. The famed director of Dark Souls and Bloodborne set aside an hour on the final day of E3 to answer my questions about Sekiro: Shadows Die Twice, the mysterious new PS4 project currently in development. PSB: Sekiro is set during the late 1500’s in Sengoku-era Japan. What led you in that direction? HM: If we’re going to do something with ninjas, there are two key areas that are relevant: the Edo period and the Sengoku period. For context, the Sengoku period was a bit earlier than the Edo period. PSB: A good fit for a FromSoftware game! HM: The other reason we landed on this period is because [it still seems] “medieval,” vs the Edo period, which feels more modern. In my mind, it felt more believable to see something mystical or having to do with the presence of gods in the Sengoku period. Another thing is that it’s set at the end of the Sengoku period. The reason for that is, in my opinion, there’s a nuance — a beauty — in the finality of something coming to an end. That fits our artistic sense, and we wanted to express that. PSB: On that note, your games often deal with death as a theme. What impact will death have on the story and gameplay of Sekiro? HM: Probably the best way to cover that question is to directly address the fact that there is resurrection in the game. My idea of a ninja fighting rather than, say, a knight fighting, is that ninjas can’t take a lot of damage. They’re taking a huge risk, they’re very vulnerable while they’re fighting. It’s this idea of fighting on the edge, it’s a risky situation where if you screw up by a hair’s breadth, it’s over. With a knight, there’s more back and forth, there’s armor and all that. The idea of that type of fighting is where the idea for resurrection came from. With that image for the combat, that it’s risky, a slight mistake and you’re dead, if you had to go back every time you die and walk back to where you were, the tempo of the game would not feel very good. The idea of resurrection is that it helps the flow of the game. Yes, you have this battle, but you don’t necessarily need to go back every time you die, this helps to balance that out and allows for that riskier “edge of the knife” type gameplay. It’s also related to the game’s story. It’s related to the mystery surrounding the main character as well as the young lord. Resurrection will have something to do with them. One of the general concepts for the game is that you can kill ingeniously — a ninja is so resourceful that he can even make use of his own death to gain an advantage. That’s kind of the idea we had. So, to answer your question, there are three ways death influences Sekiro: for the gameplay purposes of keeping the flow good and being able to have this risky situation, to be able to use it creatively, and also that the story centers around the concept of resurrection. There’s one thing I’d like to make sure isn’t misunderstood: the resurrection system was not introduced to make the game easier. If anything, it actually can make the game harder because it allows us to push the edge of risky combat where the player can die at any moment. PSB: So the game’s difficulty was balanced around the idea of knowing the player can die and resurrect? 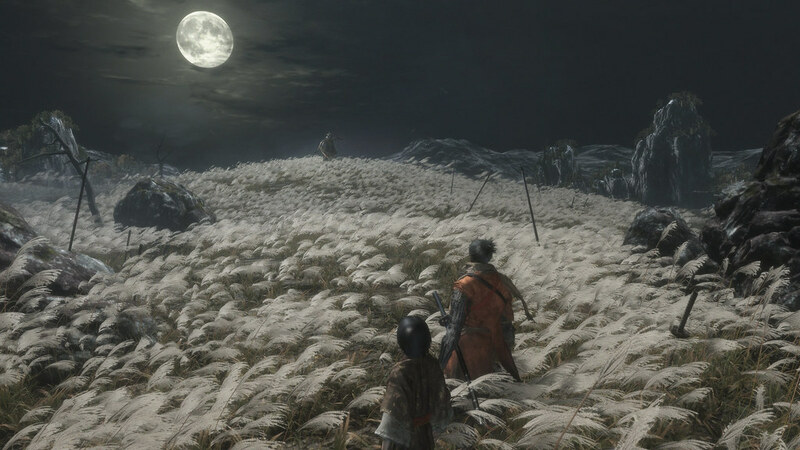 PSB: Can you speak more about what resurrection entails in Sekiro? How exactly does the mechanic work? HM: The system itself is not yet 100% final, so we don’t want to say anything that might end up changing. What we can say is that it’s in place to maintain the tempo of the game, and the difficulty of the game will be based around it. Just because you have this resurrection mechanic, it doesn’t mean the player won’t be afraid of death. PSB: Can we talk about the main character’s missing arm, and how it will affect gameplay? HM: There were two things we really liked about using a ninja, in terms of game design. We’ve always designed stages with verticality in mind, we consider it one of our strengths. What really appealed to us was being able to explore that dynamically — not relying on ladders and other ways to move around these stages, but being able to just boom, I’m there. The other thing is that when you’re designing gameplay around a ninja, it’s not like a samurai. With a samurai, you’d go right in with a sword, with a ninja you can sneak around, you can do things that are considered unfair — you can blind guys, you can do stuff that’s not honorable. It was really exciting from a gameplay perspective because it opened up so many options. So, the two key aspects of this shinobi prosthetic are that you can explore with verticality, and you have a variety of moves that you can use in combat. There was a desire to have a symbol for the idea that you have a wide variety of things at your disposal. That’s how we came up with the arm, it was a way to put that in a single place. This arm can let you do so many things, you can see that there are wires on it, there are tools on it, it kind of gives you the idea that you have this multi-use feature. PSB: Sekiro feels much faster than, say, a Dark Souls or Bloodborne. Is this more of an action game, or will fans of those series feel at home here? 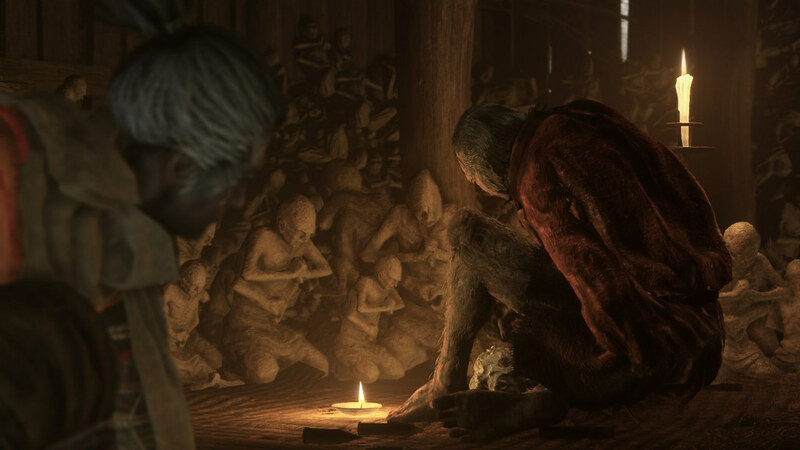 HM: There are two key things about battle in Sekiro. In combat, one of the key aspects that’s important in this game is the violence of the clashing of swords. The other thing is the verticality and dynamic movement that you’re allowed. There are lots of different things you can do that will help you in battle. The game is designed in such a way that even if you’re not insanely good at the game, you can figure out how to get through it if you think about it and play it smart. PSB: Changing gears, what’s your philosophy when it comes to the idea of “lore” versus “story”? The former being focused on world-building within the game, the other the act of actually telling a story. HM: There are some aspects of Sekiro that will be different than our previous games, and others that will be similar. 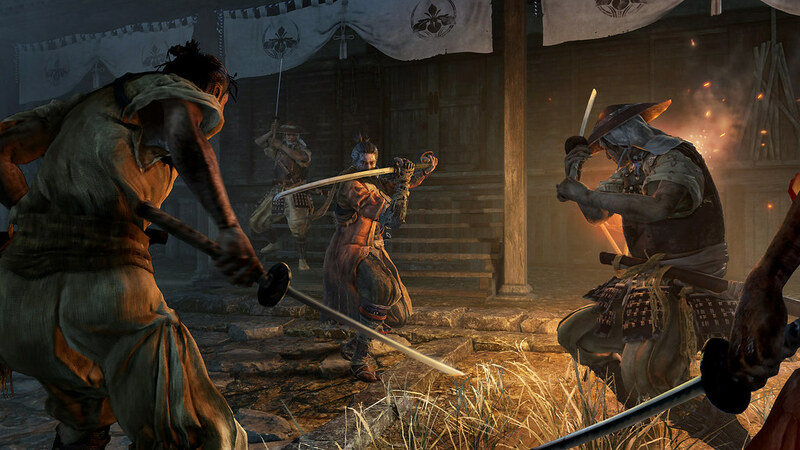 In Sekiro, the story is actually centered around the main character. He’s a character in the story, who exists in this world. Previously we had nameless characters who weren’t as involved. Thanks to making the main character part of the story, the beginning of the game is probably easier to understand than our previous games. Aside from that, not too much is different. This isn’t a game where you go through one area, kill a boss, watch a cutscene, then the game tells you where to go next. The story trickles in as you’re playing the game, you’ll find things that will give you more information on the world — the lore, if you will — along with actual story information as well. In that way, it’s similar to our previous games. PSB: Is there a particular reason you choose to tell your stories this way? Do you find that it’s a more effective way of storytelling? HM: I’m a fan of stories that require you to use a little bit of your imagination in order to really understand the whole thing. When I was young, I used to enjoy reading books that were too hard for me, where I could only read maybe half the kanji, and using my imagination to fill in the gaps. I wanted to see if I could bring that kind of experience to a video game, where you use your imagination to bridge those gaps. PSB: FromSoftware announced two games at E3: Sekiro: Shadows Die Twice, as well as Déraciné for PS VR. Has it been challenging to work on both simultaneously? HM: Actually, I’m very used to directing multiple titles at once. Armored Core 4 and Demon’s Souls were at the same time, while Bloodborne and Dark Souls 3 were at the same time. This is a pretty normal situation for me, but what wasn’t normal was announcing two games at the same time. I actually prefer “parallel direction” — directing multiple projects at once. As a creative, if you’re focused on a singular thing all the time it’s easy to get stuck in that mentality. It’s easier to find inspiration when you’re working on multiple things than it is when you’re totally focused on one. I enjoy that. 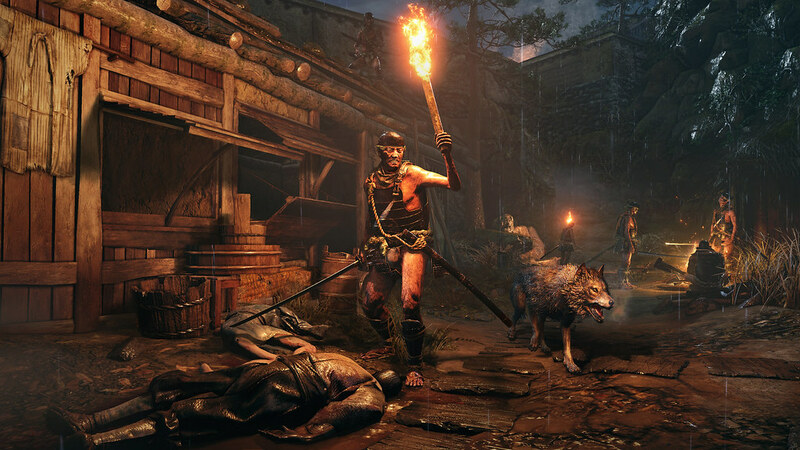 HM: Sekiro: Shadows Die Twice is a different kind of game. Our previous titles have been action RPGs, this time it’s an action adventure. There are lots of cool new things that I’m looking forward to fans enjoying. Particularly the new story format, or at least the fact that the main character is a big deal in the story. The new ways to explore the world, and the new way that you’re going to become more and more powerful. There are lots of aspects from our previous titles that I feel we’ve been able to iterate upon. The dynamic exploration, the violent swordfighting, and the huge number of strategic options. I feel that these are all major steps forward for these mechanics, and I’m really looking forward to fans playing it. The above interview was conducted via an interpreter, and answers have been edited for length and clarity. What a fantastic interview! Japanese games are coming back in a big way and I am so glad that devs like From Software have lead the way. KH3, DMC5, RE2 Remake, and Sekiro all in the first half of 2019. What a time to be a gamer! Wow, it is rare to read such a lengthy interview for HM… That in itself is interesting enough! I love the info covered in the interview. It is hard to wait for this game to come out that it is painful! Thanks Justin for a very interesting and informative interview. Great interview!! This has brought my hype and anticipation way up. Hidetaka Miyazaki is a genius! This is looking like it’ll be the first From game since… probably the first Armored Core… that I’m interested in. PLEASE MR. HM….DO NOT USE A SAMURAI SWORD OR KATANA-WARI-KATANA FOR THE NINJA!! NINJA-TO IS VERY RARELY USED IN SHINOBI GAMES.I THINK THE NINJA-TO WILL MAKE THE COMBAT MORE BELIEVABLE THAN USING THE SAME SWORD LENGTHS AS THE ENEMY.